In order to achieve maximum efficieny and at the same time save excessive ground labour, brine pipe systems are being laid in different ways according to the conditions of a building. 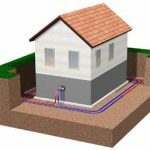 If house is built with a cellar, it naturally offers to install the pipework in the surrounding excavation before refilling. For one- and two-storey houses, a length of twice around the house will normally do. Taller houses will need one or the other extra turn. If house is built without a cellar, but with a large garden, best is to dig a trench 1,5 m (100 inches) deep. If circuits are to be laid over rather than beside to each other, the lines from the house should be laid highest and the lines going back to the house deepest. 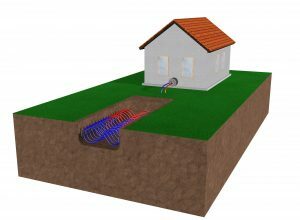 If the house is only with small garden, instead of a long trench a compact double helix exchanger can be installed in a hole of about 5*2*2 m. Such prefabricated doouble helix exchangers are offered f.e. by Freisolar in D-63820 Elsenfeld. 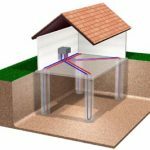 If house is built neither with cellar nor sufficient garden area can be utilised, pipes can be laid under the bottom plate. 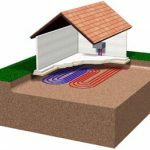 This requires however a good heat insulation underneath the bottom plate and an option to warm up the ground in summer as there is no access to sun heat. This may be achieved by using a brine operated ground heat exchanger in hot season for cooling fresh air or feeding excess heat from a solar heat unit into the ground. If house is built on poles , the pipework can to be integrated into the drill holes. Accessories for this option may be obtained f.e. from Rehau. 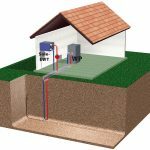 If houses have a brine-water heat pump as a heating system, which is connected to deep wells, the brine from the heat pump can also be used for the brine-air heat exchanger so that a separate brine pipe is not needed. This is not possible with brine / water heat pumps that are connected to flat or flat spiral collector. In these, the brine is too cold in winter. For the pipework, we use PE pipes, as they are generally used for the mains water supply. A suitable size is the German standard DN 25 with some 32 mm (1¼ inch) of outer diameter. Quality should be LDPE, HDPE or PEX. If laying in sand, usually LDPE is sufficient. HDPE is more hardwearing but harder to bend. PEX is definitely tougher and does not mind stone pinching, for which reason it is useful if sand bedding is impossible. In parallel rings, pipes should not be installed less than 50 cm (19¾ in.) apart from each other. 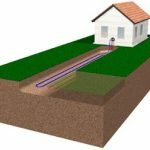 If the return pipe to the house is laid some meters next to the wastewater pipe, additional warmth can be obtained.